The HOH crew get Aj to go convince Garry to Dance. Garry doesn’t so Aj does. The hosueguests are taking their time getting ready. After they do the task you can hear people studying the task. like whats the order of the players on each side of the pool, the number of jumping jacks..
7am No other tasks were asked of the house guests yet. They are all still sleeping..
7:41am – Task 6 Lay a trail pf kitchen objects from smallest to biggest – All the way from the bedroom to the stairs. Big Brother tells the house guests that they are tasked with laying objects from the kitchen on the floor from smallest to biggest all the way from the stairs to the bedroom. Only one house guest is able to stand at a time. The house guests are told that they only have 10 minutes to complete the task or they will have to start all over again. Their is a lot of confusion with this task and the rules. Part way into the task the house guests think of rolling out the wax paper all the way from the bedroom to the kitchen. They then wait for big brother to confirm if that they completed the task. Big Brother cuts the live feeds and when they return the house guests are moving objects again so Big Brother rejected their idea of unrolling wax paper. The feeds are cut again. 8:10am – 8:40am When they return the house guests failed their first attempt and had to put everything back and start over again. They finish but are told that they have broken a rule. They have used two of the same items that are touching so they fix that and then are told that all items must be touching. 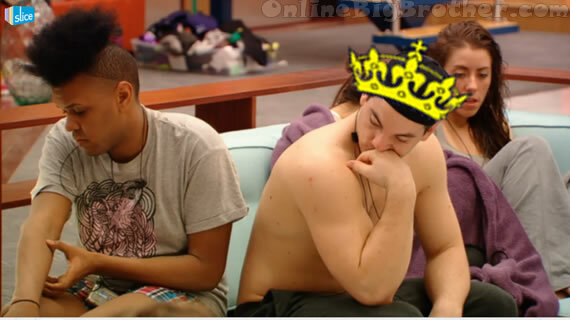 Big Brother tells them that they have completed the task only when they have returned everything to its original spot. Talla puts everything back and Big Brother tells them that they have completed the task. Most of the house guests go back to bed. Aj is pissed about how slowly Gary gets out of bed for the tasks. He says he is going to bang pots and pans over his head next time. 10:15am The Live Feeds are showing the Hush Hush screen..
11:20am The live feeds come back … they haven’t picked players or played in the power of veto yet. Alec, Andrew, Aj and Peter are talking about being woken up all night and how the US seasons do it too. who wearing the thong? looks alright!! Wow, that was hot! Hopefully we see more of Liza wearing a thong as the season progresses!